It can be used as a cost effective solution independently or in conjunction with OSB internally to ensure a continuous airtight and vapour control layer in attained. 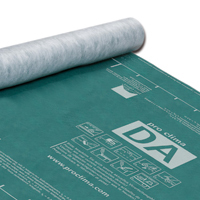 DA can be used as an external airtightness and vapour control layer on roof and walls. The membrane protects the construction from moisture during the building phase and then acts as your vapour control and airtightness layer. It is suitable for all constructions which are externally diffusion open.